While traditionally identified as a practice-based endeavour, the many dimensions of teacher education raise important philosophical issues that emphasise the centrality of ethics to questions of relationality and professional practice. This second volume of the Educational Philosophy and Theory reader series demonstrates the continuing relevance of philosophical approaches to the field of teacher education. 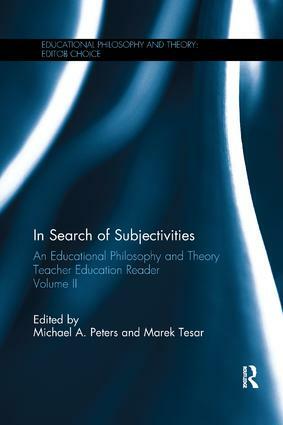 The collection of texts focuses on a wide range of topics, including teacher education in a cross-cultural context, the notion of unsuccessful teaching, democratic teacher education, the reflective teacher, the ethics and politics of teacher identity, and subjectivity and performance in teaching. Chapters also explore teacher education based on experiential learning as ‘experience’, demonstrating the continuing relevance of philosophical approaches to the field. In Search of Subjectivities will interest academics, researchers and postgraduate students in the fields of philosophy of education, philosophy, education, educational theory, teacher education, experiential philosophy, ethics, policy and politics of education, and professional practice.